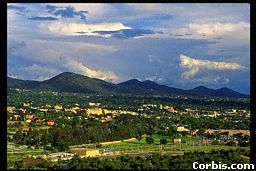 Santa Fe sits at 7,000 feet elevation. Towering above are the 12,000 foot high mountain peaks which circle this high desert city. Spanish architecture and sun-drenched landscapes shape the lives and set the clock for Santa Fe. The Sangre de Cristo Mountains invite and challenge the skier on its wide pathways, turns and terrain. During the holiday season, Santa Fe is alive with candelaria. Candles are placed in paper bags and driveways and walkways are lined with them. This is the Capitol building, fondly called "The Roundhouse." 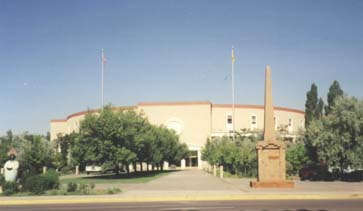 It is New Mexico's fifth capitol building. The full name of Santa Fe is (are you ready for this? )...La Villa Real de Santa Fe de St. Francisco de Assis, which means The royal city of the holy faith of St. Francis of Assisi. We're going to take a walking tour of Santa Fe along the Old Santa Fe Trail. Walking north on the Trail, on the right, behind the wall, are State Buildings. 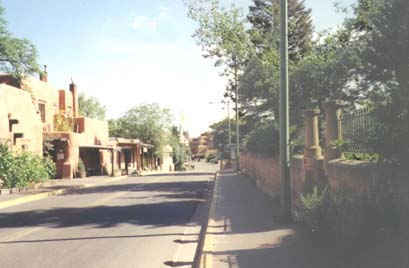 The "Pink Adobe" restaurant, on your left, has been a popular eating place for many years. On our right, we see the Chapel of San Miguel por Barrio de Analco. This chapel was constructed in 1626 and is the oldest, continuously occupied church in the United States. We're traveling down De Vargas Street to the Barrio de Analco. 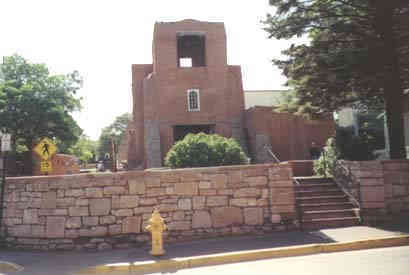 This is the oldest neighborhood in Santa Fe. 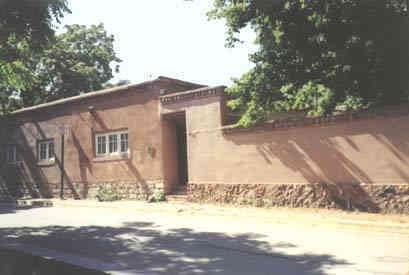 This is the old New Mexico land office on the Santa Fe Trail. 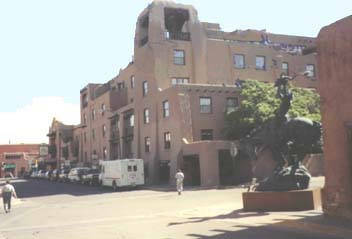 The La Fonda is a famous, historical hotel. A turn right onto San Francisco Street brings us to the Saint Francis Cathedral. You may recognize this building, which has been used in many movies. Across from the Cathedral is the WPA post office building. It is now the Institute of American Indian Arts Museum. 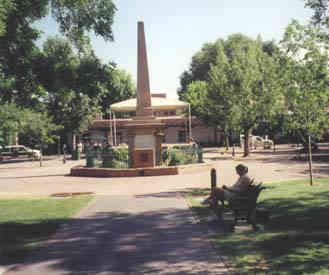 The Plaza is the center of Santa Fe. 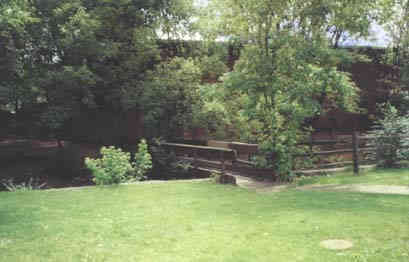 It is a gathering place and many of the city's community events take place here. This is the Gregorio Crespin House. 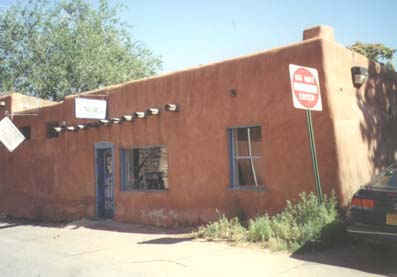 It is the oldest house in Santa Fe. We have reached the banks of the Santa Fe River. 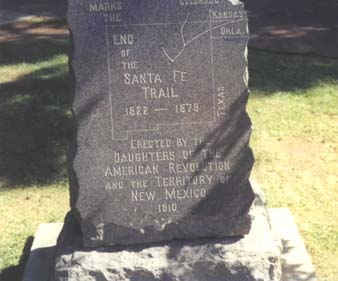 This "End Of The Santa Fe Trail Marker" was placed here by the Daughters of the American Revolution in 1911. 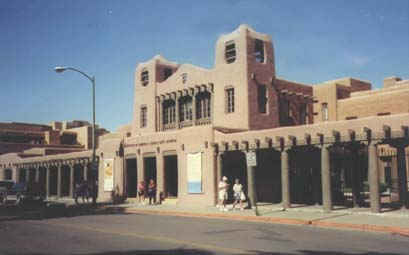 We hope you've enjoyed this walking tour of beautiful Santa Fe. One more quick side trip and we'll be leaving. 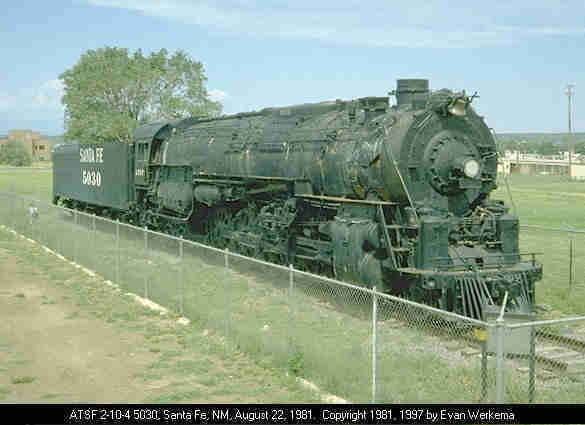 With its boiler jacket and asbestos removed, this old engine from the Santa Fe Railroad stands in mute testimony to bygone railroading days. If you'll buckle up, we're going for a short drive north.